EDIT: Increased the scale a smidge (Oblivion now 45.4 inches and Oathkeeper now 37.7 inches tip to pommel----which is what they would be irl if Riku was 5ft6'......I think. ), made progress on Oblivion, and most importantly added two PDFs of the finished Oathkeeper template. PS: I only get to use a computer about twice a week now, so if you're waiting for a request from me, sorry they're all taking so long. Oathkeeper is completely done...... I've sorted Oblivion's parts, but haven't tried to put them together at all yet. I've already made an Oblivion template before, as part of my Deep Dive Riku Pack. So, download that too if you want it before I update this. You can thank Blood Stain Child for getting me hyper enough to finish this much by today instead of NEXT Friday. 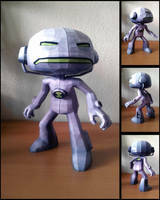 In fact, I think I gained a level in Papercrafting. Pepakura Designer has this infuriating glitch that I've finally figured out how to work around, which means I should get more templates done quicker. Such as my armors. I've been nagging my sensei for years to teach me more of that style. I freaking love it! can't craft the thing because i'm a noob in this. please teach me how to craft it. thanks, but there wasnt a final version of Oblivion? OR just deep dive riku pack? In any case, good job. Yeah, I never got back to this one. Sorry. Your papercrafts are awesome, but I think I may have bitten off more than I can chew on this one. Do you have any advice on getting the star at the end of the blade to behave? It doesn't seem to fan out properly for me. Thank you in advance for any advice. 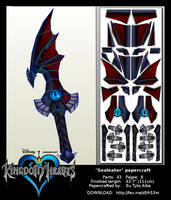 for the oathkeeper how do i insert the heart at the end of the blade there is no slit or anything marked please help. And I love these ^_^ I bet they look awesome!!! The download link for Oblivion & Oathkeeper is right on this page, on the righthand side in blue text. Likewise for all the other templates I've posted. The file only has oathkeeper and not oblivian. Is there another download file somewhere? I WAS WAITING FOR THESE TWO!!!! WELL DONE!!!! Your English is extremely confusing. 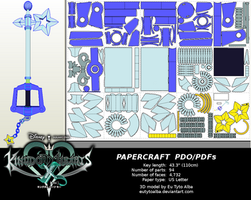 AS SOON AS I GET MY COMPUTER BACK FROM BEING REPAIRED I WILL MAKE A TUTORIAL OF HOW TO DESIGN A PAPERCRAFT. I'm going to finish my new SOLDIER template and a KHII Cloud wig for someone, and then I will make Circle of Life for you.